Woodland, NC: Surrounded By Danger! 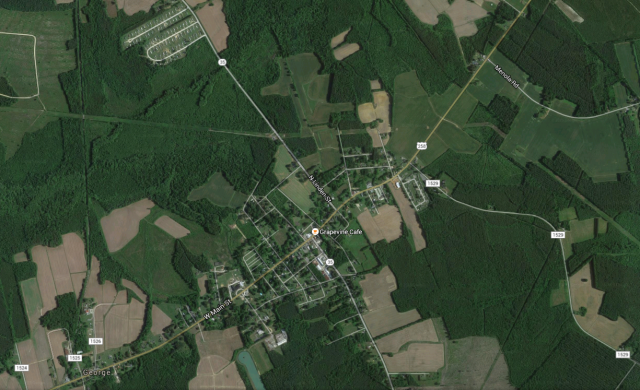 A small town in NC has gained international attention over the past week for its steadfast resistance to a new solar farm. Plenty has been written already about what this story reveals about renewable energy, technophobia, fear of corporations, and even general science education in America. It also tells us something about the power we give NIMBY's in the development process. There's something else that seems to have slipped past in this conversation though that didn't make sense to me. I decided to give Woodland the benefit of the doubt. After all their claim is that they are inundated with solar farms to the detriment of their community. I figure it might be possible since NC is indeed experiencing a major boom in solar power. Like Eric Berger at Ars Technica, I started by looking at the satellite view on Google Maps. I assumed I would find a town smothered in bright reflective panels. I was dismayed, as they were, to find no solar farms at all. I found an answer to this mystery in the mayor of Woodland's response to the widespread notoriety. The solar site don't actually exist yet. All three are under construction. This explains their absence in the aerial imagery but it does not explain how the good folk of Woodland have so much to complain about. The green line is Woodland's extra-territorial jurisdiction (ETJ). Basically, its breathing room. Armed with a description of the sites in question I went a step further to the Northampton County Tax Map to locate the accursed shiny fields of sorrow. As far as I can ascertain these are the four sites highlighted below. Three were approved but the fourth was the proverbial "last straw." In the mayor's letter one argument he suggests is that the solar farms consume Woodland's precious developable land preempting other more tax productive uses. While this is an argument we find ourselves making to communities quite often, I'm just not sure how much it matters in a town that barely grown in forty five years. The possibility of new industry is something that got my attention though. Especially given what I DID find in the aerial imagery. The body of water next to building is called a "waste lagoon." It's exactly what it sounds like and exactly as pleasant as you might imagine it to be. In my futile search for solar farms I zoomed in on pretty much anything that was industrial looking and shiny. One of the closest such suspects was this facility at the edge of town. While it may not be immediately recognizable to everyone, for anyone familiar with Eastern NC it is a common site; a concentrated animal feeding operation (CAFO) or known more commonly as a factory farm. North Carolina has a lot of these. As it turns out there are quite a few factory farms in the general vicinity. There are something like 30,000 hogs in Northampton County and another 1.5 million broilers (and only about 30,000 people). What is incredible in this story is that not only did the good folks of Woodland reject solar power because they failed to understand the principles of basic science, they did so while surrounded by surrounded by facilities well known for their risks to human health and the environment. When we make decisions we have to think about context and perspective. Maps are a good way to do that but they certainly aren't the only way. The good folks of Woodland have obviously overlooked how valuable these solar farms would be in a post-apocalyptic scenario. Older PostIs the Automobile Earth's Dominant Life Form?